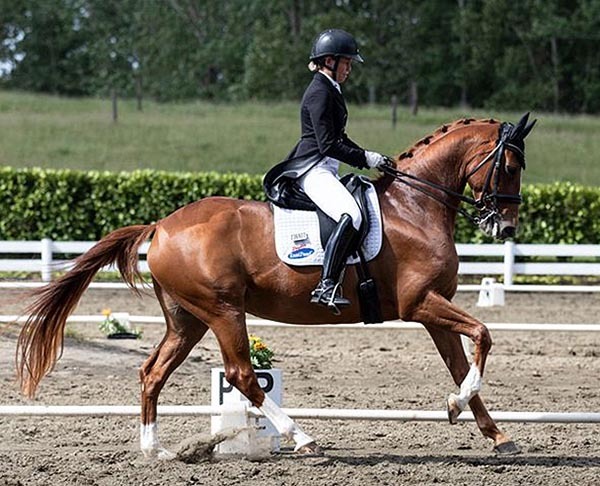 This season’s Dressage Waitemata Championship Show in Auckland saw the Verband motto ‘Erfolg in aller Welt’ (‘Success all over the world’) in living, breathing action, and was and a glowing endorsement of the skills of long-time breeder Judith Matthews. 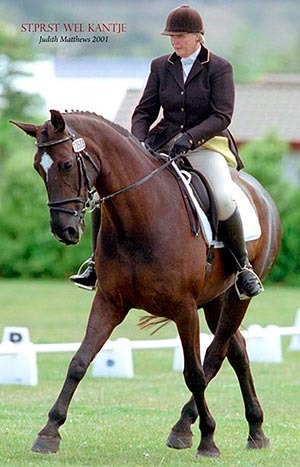 Horses from her Matthews Hanoverians stud won a fistful of titles, including the Grand Prix, Freestyle and overall championship. This particular trio of sashes went to Wendi Williamson’s Don Amour MH (Don Frederico - Adelheid MH x Anamour). This 11-yuear-old gelding is a half-brother to Williamson’s super-talented Dejavu MH, a World Cup contender who was lost to colic last year. His dam line includes the NZ champion and St.Pr.St. mare Wel Kantje (Weltmeyer x Pik Bube) and a number of other Staatsprämie mares, including Pikantje (Pik Bube x Lombard), from Claus Schridde’s Hannover Stutenstamm 1189102. Another top prospect from Matthews Hanoverian, the mare Belladonna MH (Brentano II - Grandessa x Gymnastik Star) won the Level 7 title at Waitemata for owner/rider Julie Flintoff. Belladonna was 2017’s Level 5 Horse of the Year and is looking supremely competent as she moves up the grades. The Level 6 champion was Decadance MH (Dacaprio - Adelheid x Anamour) who has won a fabulous number of titles in her short career, including New Zealand performance-bred mare of the year as a four-year-old in 2014, and five-year-old dressage champion in 2015. Decadance won both the PSG and Freestyle at Waitemata. She is owned by Judith Matthews, who gave the ride to Wendi Williamson after the untimely death of Dejavu. Decadance MH is a half-sister to both Dejavu MH and Don Amour MH. Bon Jovi MH (Bonifatius - StPrSt Wel Kantje x Weltmeyer) is another who did well for Matthews at Waitemata, finishing reserve champion in Level 5. Don Amour MH’s full brother, Don Vito MH (Don Frederico - Adelheid MH x Anamour), won Level 4 honours at the show, and Level 3 was won by the enormously promising Fanfare MH (Furstenball - Danzare MH x Dancier) ridden by Casey Burton. This young mare was the four-year-old champion last season, and the top-scoring studbook mare of the 2017 Hanoverian classification tour under Dr. Ludwig Christmann. She also took her mare performance test, finishing as an elite mare candidate with eights overall, second only to her close relative, Decadance MH! Next articleMale or female? What would you choose?